Floated in the Dead Sea. Oh, that's Israel on the other side!!! Long bus rides through Jordan apparently involve multiple police check points. Ranging from the environment police checking the pollution levels coming out of the exhaust pipe (Who knew that was a job? Smelling the back of a bus.) to the traditional "let me see your passport to make sure terrorist / drug kingpin / mafia hitman isn't written where your name should be". The one benefit about being in a country that doesn't believe in gender equality is that they only check the passports of the men on the bus. Cause, you know, only men can be shady. Not women. Spent the night camped out in Wadi Rum. Wadi meaning valley. Rum NOT meaning liquor made in Cuba. And when I find myself in the middle of a desert at night with a full moon glowing overhead, there is nothing to do other than a midnight stroll through the said desert guided by silvery moonlight. And the rumors of the elusive desert hyena only makes me realize regardless of the validity of said hyenas, the old adage really is true. I don't need to outrun the pack of hyenas. Only need to outrun the slowest person in the pack of humans. I looked around & made sure that was the case. I could totally outrun at least a handful of these humans. I was safe. Also, let's face it. I'm skinny. A hyena should know I'm just not worth the chase. 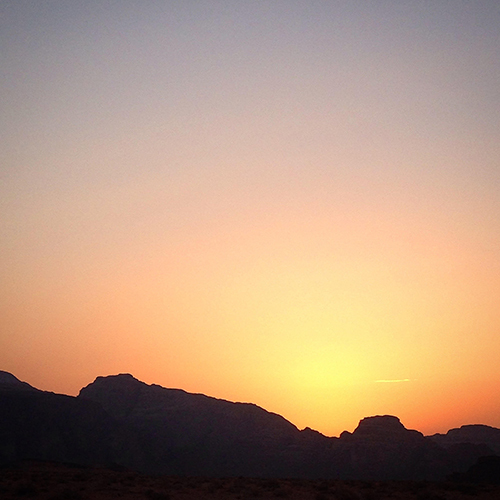 Beginning of a new day in Wadi Rum. After walking around all night, only broken up with a lie on the sand to star gaze, it was time for a predawn hike to get around an inconveniently placed mountain to watch the sunrise. Sounds amazing. Gorgeous. Stunning. It wasn't. Kinda a let down, actually. Should have slept instead. My desert all-nighter meant my time in Petra was going to be painful. Hot & exhausting with no energy to lift my camera to eye level. It was so painful that when I stopped to drink some fresh squeeze pomegranate juice in a shop, I was swaying, ready for an afternoon siesta. The shopkeeper saw my droopiness & took pity, offering up his cave for a nap. Which I did. Cause when else will I power nap in a Bedouin cave in the middle of Petra? Sadly, my first sojourn into the Middle East did not include a single terrorist sighting. Which means I'll have to go back to check that one off my list. Arabic letters of the day...haa, kha, ha. While waiting for the Bedouins to cook our dinner in Wadi Rum, a Palestinian & a Jordanian taught my new Brasilian friend & me the Arabic alphabet. It didn't go well. How can it when the letters all sound alike except for the varying sizes of hairballs induced by pronouncing each letter. Somehow HAA, KHA & HA are all diff letters that sound exactly alike to the untrained ear. At some point during our kindergarten lesson, the Brasilian questioned WHY IS IT SO EASY FOR THEM? I clarified WHY IS IT SO EASY FOR THEM TO SPEAK THEIR OWN LANGUAGE? I didn't think I was supposed to answer. Extra Arabic letter for the day...qaf. Sounds like cough spoken with a bronchitis accent. Colorful umbrellas hanging over steps leading down to a busy street in Amman.